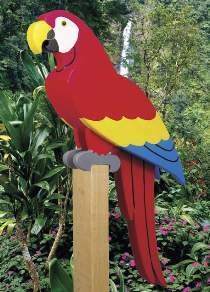 This brightly colored life sized parrot will look spectacular indoors or out. Paint as pictured or substitute other popular colors if desired. Layered construction makes it easy to cut out on your scroll saw or band saw. Make it from "1x10" and "2x8" pine boards. Patterns drawn FULL SIZE. Measures 24"H. Order yellow eyes separately below.